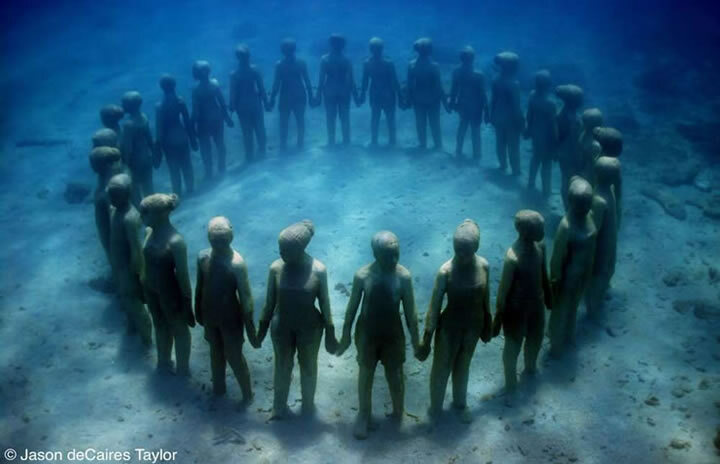 Jason deCaires Taylor's underwater sculpture Vicissitudes. I’m at the age where I have a huge backlog of memories and experiences to draw on. One thing that this means is that usually when I post something here about an artist, a movie, a book, or a poem, I find myself going over and over again to the well of my old favorites. It’s wonderful, however, to add new favorites, and Jason deCaires Taylor has become a new favorite. A former student of mine recently posted a photo of Vicissitudes on Facebook (thanks, Niah), and I was captured enough from that small image to look up more about his work. Time will tell, not only if he remains a favorite with me, but what will happen to his beautiful and moving underwater sculptures. Right now, however, I can say that I think a lot about them is really, really great. Visually, even in video rather than on site, the combination of the human figures, the blue waters that surround them, and the living fish and other creatures that move around them is stunning. For another thing, they have a practical purpose—because he is concerned about the endangered status of the world’s coral reefs, Taylor structures his sculptures to foster coral growth and hopes that they will help to form the basis of new reefs. Taylor uses live models to make plaster casts and then concrete figures of great diversity and simplicity. Even a few years after their placement under water, the figures show all kinds of changes, and their impending and ultimate obliteration forms a commentary about the human place in the world. There’s a sense that humans who don’t face up to their own eventual death and the fact of their fleshy nature are very wrong. And yet, the sculptures are gentle and loving as well—they mourn our eventual passage all the while demonstrating its inevitability. Welcome to a new favorite. There are several wonderful galleries of photos on the website (here’s one on The Silent Evolution, and check out others from the galleries tab), but please don’t skimp on watching the videos. They are very different from the still photos, and the sea flows through them. Posted in Culture & Arts, Visual Arts and tagged coral reefs, Jason deCaires Taylor, The Silent Evolution, Vicissitudes. Bookmark the permalink. Yes, the fishes seem to like them. Neat thing to notice.